At the moment, construction of ground-based ground-based telescopes is being carried out in several places of the world, promising to open the door to a new era of astronomical research. Mount Mauna Kea on the island of Hawaii, Australia, South Africa, northwestern China, and the Atacama Desert, located in Chile – in these areas with a very dry climate will be built several installations at once that will not only allow you to look further into endless cosmic expanses, but also to consider what is there with a higher level of detail. 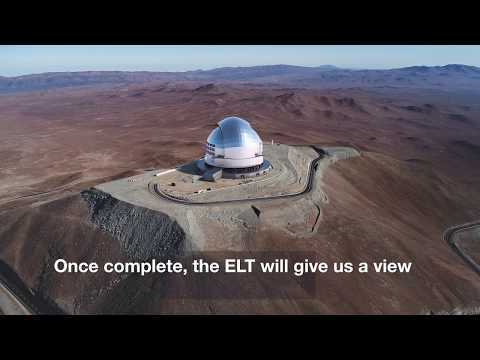 One of such facilities will be the Extremely Large Telescope (ELT) of the European Southern Observatory – the largest new-generation optical telescope equipped with a complex composite mirror with a diameter of 39 meters. The main phase of the construction of the ELT began in May 2017, after several years of disputes and discussions on the topic of where to build it. According to the current plan, the object is going to be commissioned in 2024. At the time of the approval of the construction plan in 2012, the total cost of the project was estimated at 1.12 billion dollars. In 2018, under the influence of inflation, the cost of the telescope increased to 1.23 billion dollars. According to the latest forecasts, by 2024 the cost of the entire project should be about $ 1.47 billion (with a inflation rate of 3%). To build such a system is necessary in the high-altitude region, where the effectiveness of observations will not depend on atmospheric changes and light pollution. And yet, the construction site must have a perfectly flat surface so that you can lay the foundation of a very massive installation. Having spent years of searching, the European Southern Observatory did not find such a place and eventually decided to create it on its own – on top of Mount Armasones in Chile. As seen in the photo below, the builders have already laid the foundation for the future telescope. The key feature and capabilities of the new ELT telescope will be in its main mirror, which will be composed of 798 hexagonal parts, the diameter of each of which will be 1.4 meters. As a result, this way a huge 39-meter mirror will be assembled from the pieces, capable of receiving data with an unprecedented level of quality that none of the existing telescopes are capable of. For example, the Very Large Telescope (VLT) of the same European Southern Observatory – currently the largest and most technologically advanced optical telescope – is a complex of four separate 8.2-meter and four auxiliary 1.8-meter optical telescopes, combined in one system. Having the ability to work in the interferometer mode, the angular resolution of the VLT has become equivalent to a telescope with a solid mirror up to 200 meters. But even despite this, the 39-meter ELT will be able to surpass the capabilities of the VLT. Its viewing area will be a hundred times larger, therefore, it will be able to observe immediately a large number of light sources, while noting objects with a significantly lower level of brightness that current telescopes are not capable of observing. In addition, the ELT diaphragm will be inseparable, and the resulting images themselves will not need serious processing. According to engineers, the ELT will be 200 times more efficient than the Hubble Space Telescope, making it the most powerful telescope operating in the optical and infrared bands. The project’s developers note that thanks to the sensitive mirror and adaptive optics, the settings of which will be adjusted on the basis of atmospheric turbulence, the ELT will be able to conduct direct observation of exoplanets in the orbits of distant stars, which is rarely possible using current telescopes. Since the telescope will be truly the most powerful in its class and will be able to directly observe stony exoplanets, one of its scientific tasks will be to study the atmosphere of these worlds. In this regard, the ELT will be able to make a real revolution in the search for potentially livable exoplanets outside the solar system. And this is not all of its potential opportunities. For example, with the help of an extremely large telescope, scientists will be able to directly measure the rate of expansion of the universe, which will solve several cosmological puzzles at once. For example, find out what role dark energy has played in the evolution of space. Having the opportunity to more accurately study the past of space, astronomers will be able to create more accurate models of the development of the Universe. In the following years, other ground-based telescopes such as the thirty-meter telescope (TMT), the giant Magellan telescope (GMT), the square kilometer antenna array (SKA), and the spherical radio telescope with a five-hundred-meter aperture (FAST ).